Scattered protests were reported across Yemen on Tuesday despite an agreement on a Gulf-negotiated plan that would remove President Ali Abdullah Saleh from power. Yemen's main opposition coalition agreed to the proposal on Monday, clearing the way for a political transition after two months of upheaval and violence. Under the plan, Saleh is to leave office 30 days after the plan is formally endorsed by the president and the opposition. Western news agencies report that the agreement will be signed by both sides in Saudi Arabia within a week. On Tuesday, some activists kept up demonstrations demanding that Saleh leave immediately. Western media reported government troops firing on protesters, wounding several. 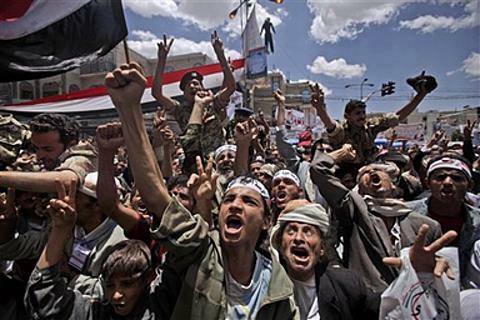 The Reuters news agency reported one death in Taiz, a flashpoint for anti-Saleh demonstrations. Protests were also reported in the port city, Aden. Opposition leaders said Monday they agreed to take part in a proposed national unity government after having received "clarifications" from the Gulf Cooperation Council. The coalition of seven opposition parties initially said it would stay out of a unity government. Under the GCC plan, a transitional government, led by a vice president named by Saleh, would take over until presidential elections are held 60 days later. The six-nation Gulf council, which includes Saudi Arabia and the United Arab Emirates, drafted the Yemen plan in consultation with the United States and the European Union. Diplomats from those nations had put increasing pressure on the Yemeni sides to accept the deal. What do you think were President Bashar al-Assad’s intentions when he agreed to an Arab League proposal to halt the ongoing crackdown against protesters in Syria?